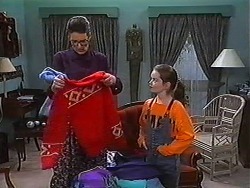 Dorothy is helping Tiffany to pack for her trip but thinks that she needs to have a clear-out because there's no way she can take it all, but Tiffany isn't happy and says that she likes all of her clothes. Tiffany thinks that she should be able to have the day off school because of the long plane ride she has ahead of her, but Dorothy won't allow it. Tiffany says that the class may get kept behind and she'll miss the plane, but this isn't enough to convince Dorothy either. Ryan comes into the living room with breakfast and jokes with Tiffany about how he won't miss her. Dorothy says that Ryan should be ready by now and reminds him that he promised to walk to school with Gemma and show her around. Dorothy says that she'll have to have her own orientation talk with Gemma today and asks if she's a nice girl. RYAN: Oh, search me, she was out with Harold when I spoke to Mrs. Bishop. DOROTHY: Oh, I hope she'll fit in. RYAN: Mrs. Bishop said she's nice. Reckons she's a real Ramsay. DOROTHY: Hope that doesn't mean she takes after her aunt. Dorothy realises that she can't close Tiffany's suitcase and tells her that they're definitely going to have to get rid of some of the clothes. Beverly approaches the door just as Helen comes out to do some gardening. Beverly says that she can't stay but came over to invite her to dinner tonight because Todd's going out. Helen says that they should spoil themselves and go to out to Lassiter's and Beverly agrees. Beverly then admits that she did want to talk to Helen about something else. She says that she's worried about the conflict she's having with Jim and wants to settle it somehow. Helen tells her that there's something that she should know; the woman that Beverly spoke to in Jim's hotel room in New York has arrived and Jim has gone to the airport to pick her up. She adds that she couldn't ask him any questions because he rushed off. BEVERLEY: Well I guess that's it then. It's obvious why she's here. HELEN: Beverly, I'm so sorry. He wants her to stay here. HELEN: It was the last thing he said before he went. And I'm certainly not very happy about it. BEVERLEY: Couldn't they have the decency to go somewhere else? Talk about rubbing my nose in it. Beverly adds that Jim could at least have spoken to her first so that she knew what was going on. 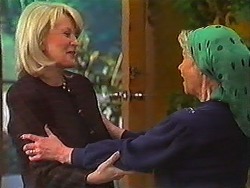 Helen asks if she wants to wait inside until they come home so that she can find it all out for herself, but Beverly refuses, saying that they're both welcome to each other. She walks off, telling Helen that she'll see her tonight. Candice asks Caroline if Paul has said anything more about her doing the PR job, but she says no. Paul comes out of his room to get some coffee, just as Melanie walks in and hands out souvenir necklaces for everyone as presents from her holiday. She tells Paul that his necklace has been blessed by the gods of generosity and so when he gives her a raise he'll feel good inside! She tells them that her holiday was the most amazing experience of her life and she met a wonderful man who's everything she ever dreamed of. She explains that his name is Roger, he's an older man, and it was love at first sight. Candice and Caroline want to know when they can meet him, and Melanie replies that he's had to go away on business but she'll introduce them to him as soon as he gets back. Paul asks if the discussion can wait until morning tea and tells Melanie that he's asked Candice to stay a little bit longer just to help her to get back into the swing of things. Melanie says that's great news as she has so much to talk about. She carries on gossiping, making Paul realise that he's fighting a losing battle trying to get her to keep quiet and so he returns to his room. Toby tries to scare Tiffany about the thought of going away, speculating that there could be witch doctors and she could be dragged away and turned into a zombie. Ryan decides to play along and sneaks up on Tiffany from behind, scaring her. Dorothy enters the living room and comments that Gemma's late, but there's a knock on the door at just that moment. Ryan answers to find Gemma waiting, and immediately looks quite taken with her. Gemma is confused by his surprised expression and reminds him that they were expecting her, and he pulls himself together and invites her in. RYAN: This is my aunty Dot. DOROTHY: You may call me Mrs. Burke. GEMMA: Hello, it's nice to meet you. My aunt's told me all about you. Guess I'm lucky, getting in good with the headmistress early! DOROTHY: As Ryan will no doubt inform you, I am not known for showing any kind of favouritism. GEMMA: No, I mean, you couldn't be as bad as the principal at my last school, my God was she a dragon! Well, I mean, I'm sure that you're not one. A dragon, that is. RYAN: Whoa, look at the time, we better get going. DOROTHY: It's always a good idea to think before you speak, Gemma. Helen is on the phone with a law firm, finding out when the reading of Derek's will is going to take place. Helen seems reluctant to attend because there's already tension about the whole thing but is convinced by the firm that it's what he wanted. The discussion ends just as Jim enters with suitcases. Helen tells him that she wishes he had told her about his plans before now, and adds that he's being very insensitive. However, Helen is cut off when Rosemary appears at the door. They hug, and Rosemary says that she wanted to keep her visit a secret. ROSEMARY: I'm sorry to throw you into a spin, but I'm the woman from New York. Time has passed and Helen and Rosemary are making tea in the kitchen. Rosemary explains that her friend Sonia has died from cancer but didn't tell her about the diagnosis until the last few months of her life. Rosemary says that she felt guilty that she hadn't realised sooner, but Helen points out that she obviously didn't want Rosemary to know. They move into the lounge, and Rosemary explains that she was lucky that Jim was in New York when she needed a shoulder to cry on. She says that the next thing she knew, it was 6am in the morning. Helen realises that must have been when Beverly phoned the hotel room, and Rosemary insists that she would have cleared everything up there and then if she'd realised who she was speaking to. Helen says that she's furious with Jim; he's been home long enough to have cleared everything up with Beverly, but Rosemary says she can see Jim's point of view; everyone has jumped to conclusions so he's just letting them stew in their own juices. Helen says that given the situation he left before going to New York, he could at least have explained things to Beverly. Rosemary concedes that she can see both points of view. They bring the subject back to Sonia. Rosemary says that Sonia had to divide her time between Australia and New York because of her work, and her daughter Tracy is in boarding school here in Erinsborough. Helen realises that Rosemary has returned to Erinsborough to check on her. ROSEMARY: It's a little bit more than that, mum. Before she died, Sonia asked me to take care of Tracy. HELEN: Oh darling, that's a great deal for you to take on. ROSEMARY: Tell me about it. But that's why I'm here. I've got to sort out Tracy's future. 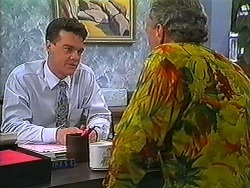 Jim sits down at the desk with Paul, as Caroline works at her own desk in the corner. Paul says that he thinks they should get the sale of the workshop underway, and Jim agrees. Paul says that there's only one problem; he's feeling snowed under at the moment and hasn't got a lot of spare time. However, Paul goes on to say that Caroline has been bugging him to do some negotiations, so if Jim has no objections, he'd like her to handle it. Jim says it's fine, but Caroline is initially reluctant, explaining that she had hoped to be involved with Lassiter's and she doesn't know anything about garages and workshops, but eventually agrees to the idea. She arranges to pop over to Jim's later for an initial meeting. Ryan and Gemma are sitting at one of the tables, chatting. Gemma tells him that she really liked his friends and thanks Ryan for introducing her to them. Ryan says that he understands what it's like to be the new kid, so it's fine. Ryan asks if she's going to get involved in any sport; Gemma says that she likes netball and sometimes goes surfing too. Dorothy enters the Coffee Shop and reminds Ryan that they're supposed to be taking Tiffany to the airport. Ryan says that he's already said his goodbyes to Tiffany and she doesn't expect him to come, but Dorothy insists that he should be there. She then asks Gemma how she found her first day at school; Gemma says that there were a few funny things to get used to, but it was good. DOROTHY: Well, don't forget, we have to get used to you as well. She tells Ryan to hurry up and finish his drink, and he tells her that he was planning to study with Gemma. Gemma says that they can do it when he gets back from the airport, so Ryan finally agrees to go. Toby is at the fridge drinking juice from the bottle, and Tiffany walks in and sneaks up on him. She tells him that she's just said goodbye to Kerry and Sky, who are outside. Tiffany gives Toby a goodbye present; it's fool's gold and she says that it's perfect for him. He promises to keep it in his bedroom. TOBY: If you ever come back from New Guinea, will you bring me back a present? TOBY: I dunno, a shrunken head maybe. Tiffany agrees and says that she has to go now because Dorothy will be waiting for her. She says goodbye to Bouncer and Toby and leaves. Toby looks sad to see her go. Caroline and Jim are sitting at the kitchen table, working. Jim says that the whole thing must be boring for her after the glamour of the hotel industry, but Caroline replies that she likes learning about new things. She tells him that she has enough information for now and gets up to leave, but he insists that they both have a glass of wine after their hard work. Caroline agrees to it, telling Jim that she was only going back home to do more work anyway. Jim is surprised, and she tells him that she likes to keep busy. JIM: Don't let it eat you up. An attractive woman like you ought to be out having a ball. Caroline tells Jim that her private life is non-existent. Melanie asks Candice if she has another temp job for tomorrow, explaining that it's been good to work with her and it's a shame it can't be a permanent thing. Candice tells her that it's possible because Paul told her that she'd be great at hotel PR. Melanie is hurt; she's been working for Paul for ages and he's never given her a job like that. Candice assures her that nothing's definite yet anyway. Melanie asks if she has experience in that area, and Candice admits that she doesn't, but she does have strong references and is a quick learner. She then says goodbye and leaves for the day. Melanie enters Paul's room and confronts him over giving Candice the PR job when she's only been working for 2 weeks filling in for her. She adds that she's PRed for him heaps of times and he always seemed happy with her work. Melanie tells him that he's being completely unfair, but Paul insists that she's got the wrong end of the stick. He says that he relies on her and Caroline to do PR and he has no plans to change that arrangement. MELANIE: Candice thinks that you've offered her a job. PAUL: Of course she doesn't. MELANIE: She does! What did you say to her? PAUL: Nothing! Alright, I was a little encouraging. MELANIE: I bet you were. PAUL: Look, don't worry, I will talk to her in the morning. MELANIE: Well you'd better, Paul, because when you lead people on someone always gets hurt. Jim and Caroline are chatting as they sit on the couch drinking their wine. Jim tells her that while he was building up his engineering work he didn't have much time to spend with his family, which was tough on them. He tells her that his perspective changed when his business partner made him lose everything. He chose the workshop because it was a slower pace and he'd be able to spend more time with his kids, but by that point, they were older and didn't want to spend as much time with him, while his wife was obsessed with her career, so he didn't have much to come home to. Caroline asks if that's why he and Beverly broke up, but stops herself, realising it's none of her business. Jim assures her that it's good to talk about it. He continues, saying that the trip to New York opened his eyes, and there must be a way to combine a successful career with a relationship. Jim then tells her that Helen's left a casserole in the fridge and asks if she wants to share it with him. Caroline agrees. Ryan and Gemma are sitting in the living room with their books, chatting away. Dorothy enters and scolds them for not paying attention to their work, adding that they would be better off if they studied separately. Ryan asks why they can't relax if they've finished their work, but Dorothy says he has chores to do if that's the case. She says that it must be time for Gemma to be back home anyway, and so Gemma takes the hint and tells Ryan she'll have to go. Ryan walks her to the door, and they arrange to study again tomorrow. Dorothy calls from the living room, reminding Ryan that he's supposed to be helping Joe tomorrow afternoon. Ryan shouts back, telling her he can do both. GEMMA: I don't think your aunt likes me very much. RYAN: No, no, she does. She's just kinda strict, she can't help it. You'll get used to her. She says goodbye and leaves. Ryan re-enters the living room, where Dorothy has been checking his homework. RYAN: What have you got against Gemma? RYAN: She doesn't think you like her. DOROTHY: That's ridiculous, she seems quite a pleasant young girl. Helen and Rosemary are at a table with a glass of wine each. At that moment, Beverly enters and is surprised but happy to see Rosemary. Helen tells Beverly that only Jim knew that Rosemary was coming and that he picked her up from the airport this morning. ROSEMARY: Guilty. I was very upset that night. ROSEMARY: Oh Beverly, I didn't realise it was you on the phone or I would have identified myself. Jim was helping me through a crisis and it was all perfectly above board. Pity neither of us recognised the other's voice, but it was a bad line. HELEN: So now you know what's happened, it should make it easier for you and Jim to talk. BEVERLEY: I have no intention of talking to Jim. ROSEMARY: Oh, Beverly. Look, I've told you the truth. BEVERLEY: I don't doubt you, Rosemary. But he's let me think there was another woman when all along he could have put my mind at rest. If he doesn't care about my feelings, why should I give a damn about his? Jim pours more wine and tells Caroline that New York had a big effect on him and made him realise what's important to him. He now wants more of a challenge in his life but doesn't want the work to take over. When he meets someone, he wants to be able to pursue a relationship, but he knows that it won't be easy to meet someone because of his age. Caroline tells him not to be silly and that he's not old. She says there's probably a thousand women out there who'd like to have him in their life. Caroline adds that she wishes she could be as sure that there was someone out there for her. They both agree that it was good to have someone to talk to, and Caroline tells Jim that she'd better be off as she has work tomorrow. Jim reminds her that they've forgotten about the casserole. He tells her that he doesn't want her to go yet, and invites her out to dinner. Smiling, Caroline agrees to go.